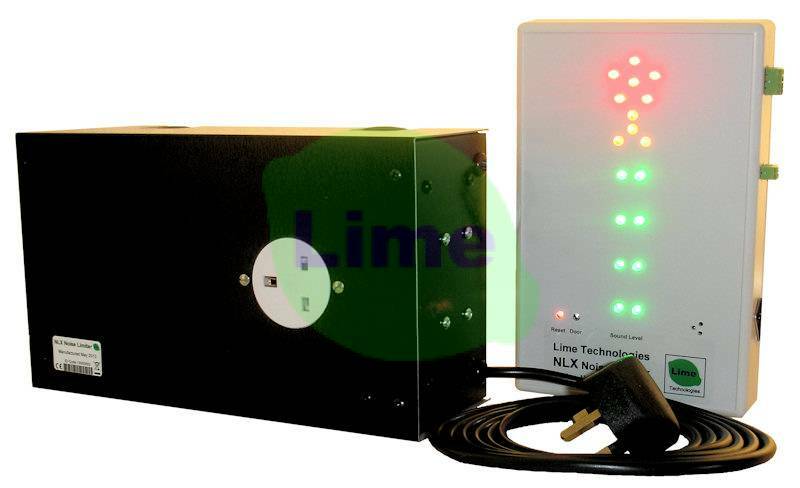 Noise Limiter - easy DIY installation or use as portable unit. Ideal for marquees. Approved by Environmental Health Departments. No professional installation required. Supplied complete with full instructions. The fast Fit Noise Limiter has been designed in response to demand for a low cost, easy to install solution to the growing problem of noise complaints. Please Note: For unsupervised venues we recommend that the Noise Limiter is permanently installed so that it has control of all available mains socket outlets. The mains control unit is housed in a separate case fitted with 2.2 metres of mains cable and a 13 amp plug. On the front of the unit is a flush, 13 amp mains socket into which the sound equipment is plugged (multi way extension leads can be used). The sound level in the venue is monitored by the microphone built in to the display unit and the sound level is indicated by high intensity LEDs. If your preselected level is exceeded the red LEDs light (and the optional high intensity beacon if purchased). If the sound remains too loud for a period of approximately 10 seconds mains power is disconnected from the sound equipment for 10 seconds and then automatically reconnected; thus no user intervention is required for operation. The trigger level is easily adjustable and comprehensive instructions are supplied to facilitate simple calibration. Adjustment of the trigger / reset delay time can also be carried out. • Optional high intensity warning beacon - recommended when display unit cannot be fitted in performers direct line of sight.